Go to original pattern for design DROPS 187-8. 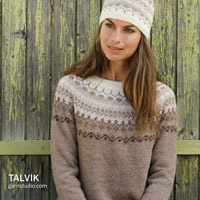 Knitted sweater with round yoke and multi-colored Nordic pattern, worked top down. Sizes S - XXXL. The piece is worked in DROPS Paris. DROPS DOUBLE POINTED NEEDLES AND CIRCULAR NEEDLE (40 + 80 cm / 16'' + 32'') SIZE 5.5 MM/US 9 – or the size needed to get 16 stitches and 20 rows stockinette stitch on 10 cm / 4'' in width and 10 cm / 4'' in height. DROPS DOUBLE POINTED NEEDLES AND CIRCULAR NEEDLE (40 and 80 cm / 16'' and 32'') SIZE 4.5 mm/US 7 for rib – or the size needed to get 18 stitches and 23 rows stockinette stitch on 10 cm / 4'' in width and 10 cm / 4'' in height. To work out how to decrease/increase evenly, count the total number of stitches on the needle (e.g. 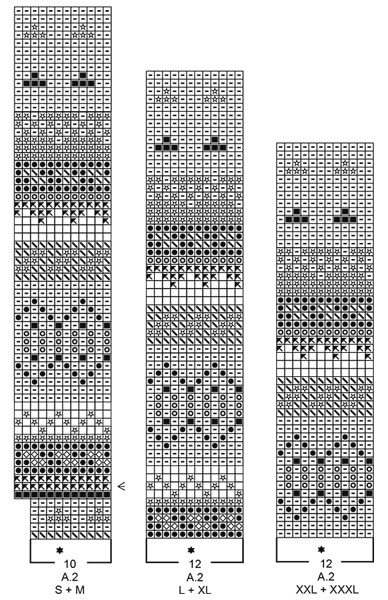 90 stitches) and divide by the number of decreases/increases to be made (e.g. 6) = 15. 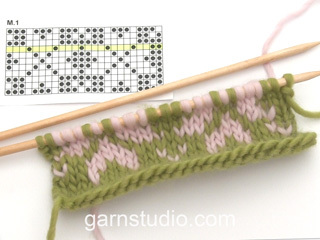 In this example, decrease by knitting together every 14th and 15th stitch. When increasing make 1 yarn over after every 15th stitch. On the next round/row work the yarn overs twisted to avoid holes. To avoid the knitting gauge becoming tighter when working pattern, it is important that the strands at the back of the piece are not tight. You can use a size larger needle when working pattern if this is a problem. Start 2 stitches before the marker thread, knit 2 together, slip 1 stitch as if to knit, knit 1, pass the slipped stitch over the knitted stitch (= 2 stitches decreased). The yoke and body are worked in the round with circular needle, top down to where the rib begins, then the front and back pieces are worked separately back and forth. The sleeves are worked in the round with short circular needle/double pointed needles, top down. Cast on 90-96-96-102-102-108 stitches with short circular needle size 4.5 mm / US 7 and raspberry. Knit 1 round. Change to dark beige and work the next round as follows: * Knit 3, 3 stitches in GARTER STITCH – see description above *, work from *-* to end of round. Continue the rib like this until the neck measures 4 cm / 1½''. Knit 1 round where you decrease 6-10-6-8-4-6 stitches evenly on round – read DECREASE/INCREASE TIP = 84-86-90-94-98-102 stitches. Change to circular needle SIZE 5.5 mm/US 9. Knit 1 round where you increase 31-29-30-31-32-33 stitches evenly on round = 115-115-120-125-130-135 stitches. Then work the yoke as described below. Work A.1 in the round (= 23-23-24-25-26-27 repeats of 5 stitches). Continue the pattern as shown in the diagram. 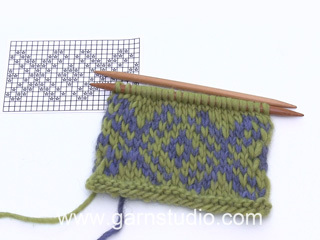 Read KNITTING TIP and REMEMBER THE GAUGE! Arrow-1: Increase 15-19-20-22-23-25 stitches evenly on round = 130-134-140-147-153-160 stitches. Arrow-2: Increase 14-18-20-21-23-24 stitches evenly on round = 144-152-160-168-176-184 stitches (you now have room for 18-19-20-21-22-23 repeats of 8 stitches). Arrow-3: Increase 30-34-38-42-40-44 stitches evenly on round = 174-186-198-210-216-228 stitches. Arrow-4: Increase 26-29-32-35-34-32 stitches evenly on round = 200-215-230-245-250-260 stitches (you now have room for 40-43-46-49-50-52 repeats of 5 stitches). Arrow-5: Increase 24-25-26-27-30-28 stitches evenly on round = 224-240-256-272-280-288 stitches (you now have room for 28-30-32-34-35-36 repeats of 8 stitches). Arrow-6: Increase 18-20-12-20-24-24 stitches evenly on round = 242-260-268-292-304-312 stitches. The increases are finished in sizes S and M.
Arrow-7: Increase 12-18-21-18 stitches evenly on round = 280-310-325-330 stitches. 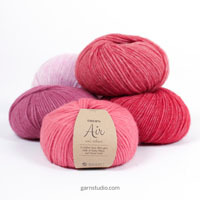 Increases are finished in sizes L and XL. Arrow-8: Increase 19-18 stitches evenly on round = 344-348 stitches. Increases are finished in sizes XXL and XXXL. Finish working A.1. The piece measures approx. 24-24-28-28-32-32 cm / 9½"-9½"-11"-11"-12 ½"-12½'' from the cast-on edge. The next round is worked as follows (with moss green in sizes S and M, apricot in sizes L and XL and with off white in sizes XXL and XXXL): Place the first 42-46-52-55-60-60 stitches on 1 thread for sleeve, cast on 6-6-8-8-8-12 new stitches on the needle (= in side under sleeve), knit 79-84-88-100-112-114 stitches (= front piece), place the next 42-46-52-55-60-60 stitches on 1 thread for sleeve, cast on 6-6-8-8-8-12 new stitches on needle (= in side under sleeve) and knit the remaining 79-84-88-100-112-114 stitches (= back piece). Cut the strands. Body and sleeves are finished separately. THE PIECE IS NOW MEASURED FROM HERE! = 170-180-192-216-240-252 stitches. Insert 1 marker thread in the one side of the piece, in the middle of the 6-6-8-8-8-12 stitches cast on under sleeve. Start the round here and work A.2 in the round (= 17-18-16-18-20-21 repeats of 10-10-12-12-12-12 stitches). On the round marked with arrow-7 in A.2 decrease 2 stitches evenly on round (applies only to size S) = 168-180-192-216-240-252 stitches. When A.2 has been completed, the piece measures approx. 33-33-29-29-25-25 cm / 13"-13"-11½"-11½"-9 3/4"-9 3/4'' from the division. Continue with stockinette stitch and dark beige. When the piece measures 34-36-34-36-34-36 cm / 13½"-14 1/4"-13½"-14 1/4"-13½"-14 1/4'' from the division (or to desired length, there is 4 cm / 1½'' left to finished length) divide the piece for a split in each side. Keep the first 84-90-96-108-120-126 stitches on the needle and place the remaining 84-90-96-108-120-126 on 1 thread or extra needle. Knit 1 row from the right side - AT THE SAME TIME increase 15-21-21-21-21-27 stitches evenly on this row (do not increase over the outermost 3 stitches in each side) = 99-111-117-129-141-153 stitches. Change to circular needle size 4.5 mm / US 7 and work rib as follows from the wrong side: 3 edge stitches in GARTER STITCH – see description above, * purl 3, knit 3 *, work from *-* until there are 6 stitches left on the row, purl 3 and finish with 3 edge stitches in garter stitch. Continue the rib like this for 4 cm / 1½''. 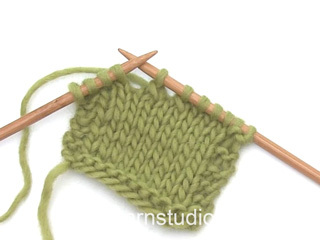 Bind off with garter stitch over garter stitch, knit over knit and purl over purl, but to avoid the bind-off edge being tight, make 1 yarn over after every 6th stitch at the same time as you bind off (yarn overs bind off as normal stitches). Work in the same way over the stitches on the thread/extra needle. The sweater measures approx. 64-66-68-70-72-74 cm / 25¼''-26''-26¾''-27½''-28 3/8''-29 1/8'' from the shoulder down. Place the 42-46-52-55-60-60 stitches from the thread on the one side of the piece on short circular needle SIZE 5.5 mm/US 9 and, in addition, knit up 1 stitch in each of the 6-6-8-8-8-12 stitches cast on under the sleeve = 48-52-60-63-68-72 stitches. In sizes M, L and XXXL work A.2 from and including stitch 2 in the diagram. 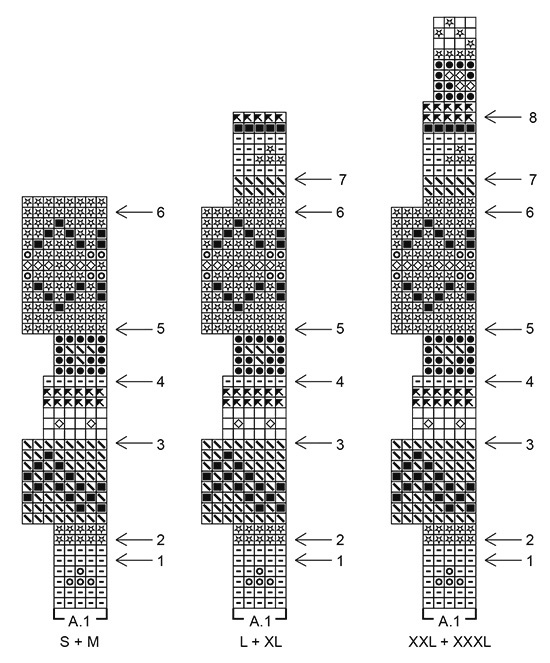 In size S work A.2 from and including stitch 3 in the diagram. 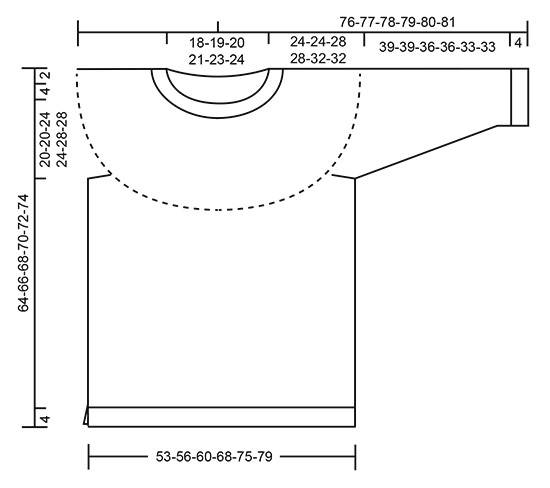 In size XXL work A.2 from and including stitch 4 in the diagram. In size XL work A.2 from and including stitch 6 in the diagram. When starting on these different stitches, all sizes will then match the marker thread on top of sleeve with the stitch marked with a black star in the diagram, but because of different numbers of stitches in A.2 in sizes S and M the start of the round will need to be recounted when the number of stitches in the repeat has changed to 12 stitches in these sizes. AT THE SAME TIME when the piece measures 3-3-3-2-2-2 cm / 1"-1"-1"-3/4"-3/4"-3/4'' from the division, decrease 2 stitches mid under the sleeve – read DECREASE TIP. Decrease like this every 5½-5-3-3-2½-2 cm / 2 1/4"-2"-1"-1"-7/8"-3/4'' a total of 7-8-11-12-13-15 times = 33-35-37-39-41-41 stitches. When A.2 has been completed finish working the sleeve with dark beige. When the piece measures 39-39-36-36-33-33 cm / 15 1/4"-15 1/4"-14 1/4"-14 1/4"-13"-13'' from the division, knit 1 round where you increase 9-7-5-9-7-7 stitches evenly on round = 42-42-42-48-48-48 stitches. 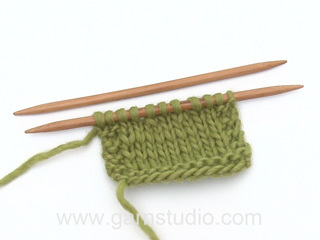 Change to double pointed needles size 4.5 mm / US 7 and work rib in the round (= knit 3 / purl 3). When the rib measures 4 cm / 1½'' bind off with knit over knit and purl over purl, but to avoid the bind-off edge being tight, make 1 yarn over after every 6th stitch at the same time as you bind off (yarn overs bind off as normal stitches). The sleeve measures approx. 43-43-40-40-37-37 cm / 17"-17"-15 3/4"-15 3/4"-14½"-14½'' from the division. Work the other sleeve in the same way. Bonjour, Je ne comprends pas alors qu'on ouvre des 2 cotés, comment on peut faire le bas avec des aiguilles rondes. Je suis déoslée de revenir vers vous Cordialement. Bonjour Mme Chapard, on commence en rond par le col, on va augmenter pour l'empiècement, puis, on va mettre les mailles des manches en attente, monter des mailles sous les manches (= au-dessus des mailles en attente) et terminer le dos et le devant en rond. On reprend ensuite les manches l'une après l'autre pour les tricoter. cette vidéo montre comment tricoter un pull raglan de haut en bas, le principe sera le même ici, sauf que les augmentations de l'empiècement se feront réparties et non au niveau des raglans. Bon tricot! Nous avons deja repondu a votre question. Bon travail! Bonjour Annick, le dos/le devant se tricotent en rond sur aiguille circulaire no 5,5. En bas (juste avant les cotes) vous augmentez dez mailles pour que le bas de l'ouvrage ait la meme largeur, c'est-a-dire pour que les cotes (a travailler aller et retour sur aiguille circulaire no 4,5) ne resserent pas votre ouvrage (voir le dessin en bas de page). Bon tricot! Hello , I love this pattern but now that I reached the sleeves, I don’t understand how to apply A2 diagram to an uneven number of stitches on sleeve. ( 47 stitches after 1 stitch decrease) I’m knitting size S. Thanks for your help! Dear Dia K, start sleeve in the middle of the 6 new sts picked up mid under sleeve, work first A.2 starting with 3rd st on diagram (= work 7 sts), then repeat A.2 (all sts in diagram = 10 sts x 4 = over the last 40 sts). When the repeat will have to be worked over 12 sts, then make sure the marker thread mid on upper sleeve match the stitch with a star in diagram. Read here how to center a diagram. Happy knitting! Peut-on réaliser ce modèle avec des aiguilles droites? Bonjour Isabelle. Cela peut etre un peu difficile, en particulier en realisant l'empiècement. Voici la lecon sur ce sujet: cliquez ICI. Bon travail! Liebe Frau Köhler, die Kategorie "Zu favoriten hinzufügen" finden Sie unter die Beschreibung von Garn und Nadeln, neben den Druckknopf Anleitung/Fotos. Viel Spaß beim stricken! I'd like to knit this pattern exactly with all the colours used but can't seem to find them on your store. Are they out of stock? Dear Mrs Waybunre, the colours are not discontinued, feel free to contact your DROPS store - even per mail or telephone, they will be able to let you know if/when they have them. Happy knitting! Modello stupendo....ma la quantità di materiali in alcuni colori appena sufficiente o addirittura scarsa! Ho seguito esattamente il pattern per la taglia S, misure identiche, campione ok. Colori 17 e 25 rimasti circa 2 metri di filo, avevo paura di non farcela. Il colore principale 26 non è sufficiente nemmeno per la taglia S ( non immagino la M, dove è indicata la stessa quantità). Ho fatto delle modifiche e ho lasciato le maniche a 3/4.... Un vero peccato! Buongiorno Maria. La ringraziamo per la sua segnalazione. Verrà trasmessa al settore design per una verifica ed una eventuale correzione delle quantità. Buon lavoro!